The TerraHaus residence hall incorporates many specific design features that enable it to attain the Passive House energy standard. Below is a brief description of several of these important components. A more detailed explanation will be found in blog posts on the home page as the construction proceeds. I’ll also add photos illustrating components during construction. 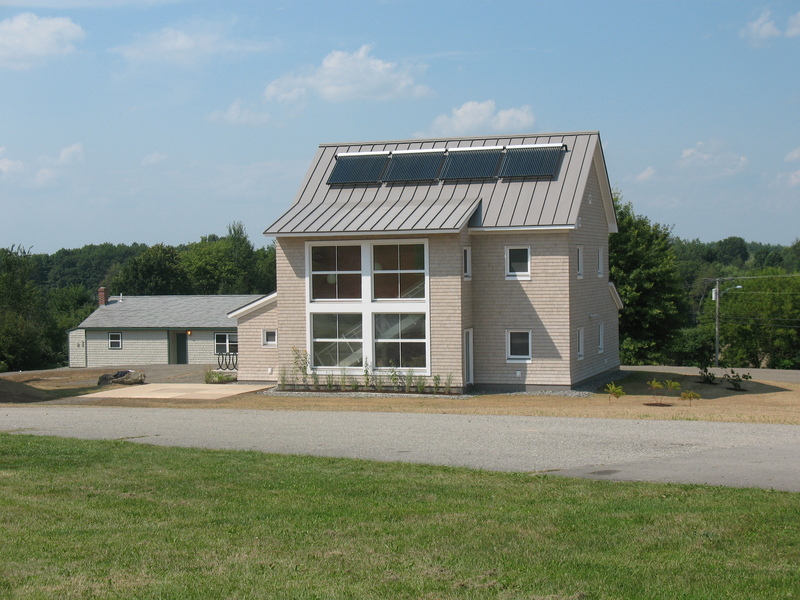 The name of the Passive House standard is derived from the emphasis on passive heating. Passive heating means that the space heating requirements are met largely through passive means—the natural sunlight coming through the windows, the heat generated by appliances in the course of routine daily activities, and even the warmth given off by the residents(on average, human beings at rest give off about 100 watts or 35 Btu per hour in body heat! ASHRAE Fundamentals, 2005). The supplementary heat needed for the TerraHaus building will come from electrical resistance heat through electric baseboard radiators and a heat pump. 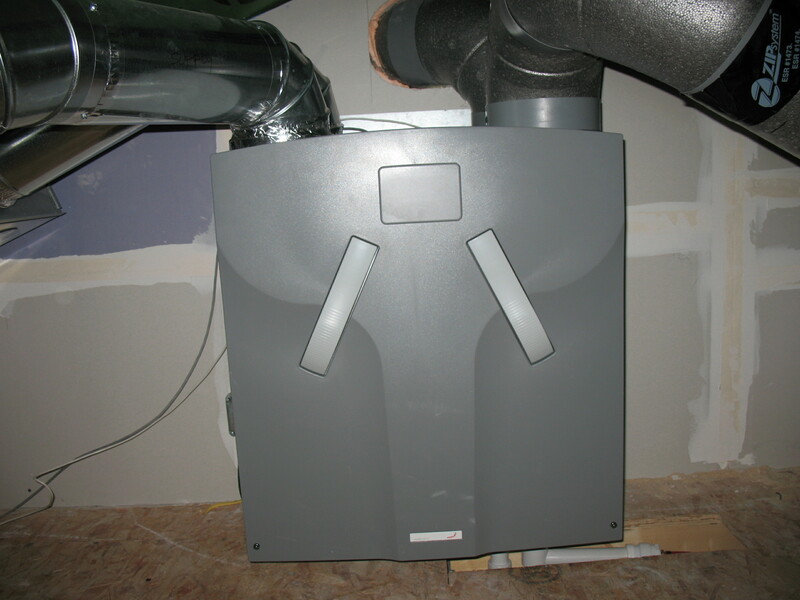 To meet Passive House standards, the space heating requirement must be less than 4800 Btu/ft2/year. In zero degree weather, in the dead of night, the heat load for this residence will require the energy generated by the equivalent of 1-2 hair dryers! 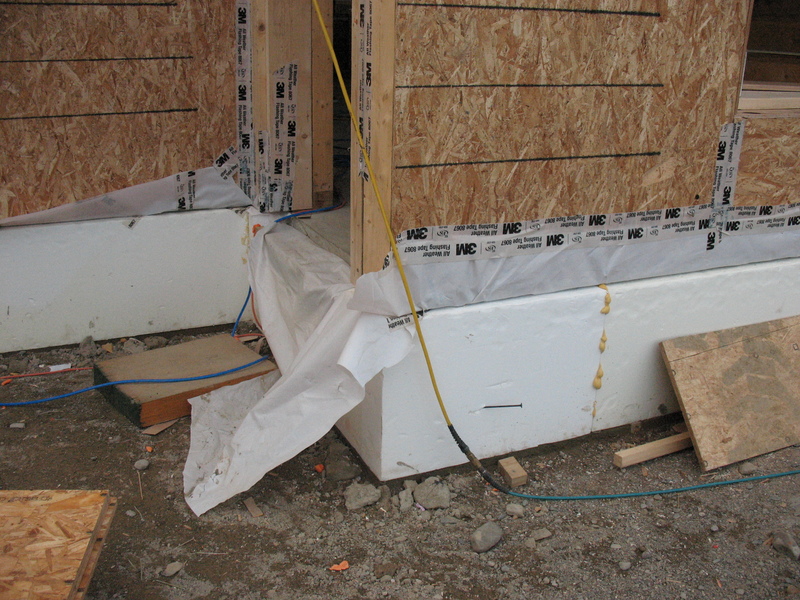 Air infiltration is one of the main energy concerns with conventional house construction. The air that leaks through gaps in door and windowframes, the meeting point of different building materials, and perforations into the attic from wiring and plumbing (to name just a few points of concern) has a cumulative impact on the house’s heating and cooling needs. 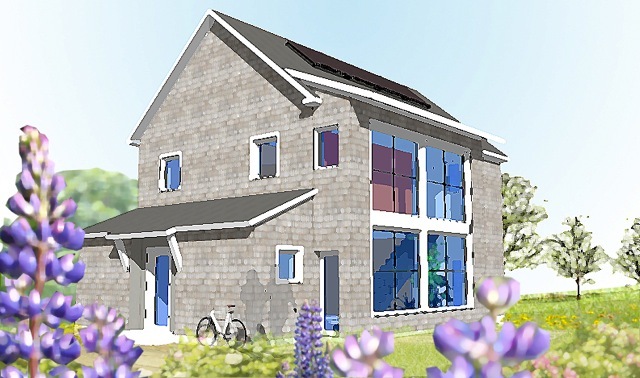 The Passive House strategy is to build homes that are super tight. By reducing or eliminating drafts, the home’s demand for space heating is significantly reduced. Keeping moist air out of the building also prevents structural damage from condensation over time. Even a home that is not built to such strong standards of air sealing can be evaluated for leaks by means of a blower door test, which identifies trouble spots by depressurizing the home and tracing the leaks. Those leaks can then be sealed by several different means, including caulking, weatherstripping, and air barriers such as house wraps. Airtightness is a valuable standard to measure the overall efficiency of a home. To meet Passive House certification standards, a house may not have over 0.6 ACH (air changes per hour) at the accepted pressure test standard. SIPs are Structural Insulated Panels used for the walls and roof of the TerraHaus. Traditional framing, even with 2 x 6 or thicker stud walls, has some energy conservation drawbacks that are reduced with SIPs. 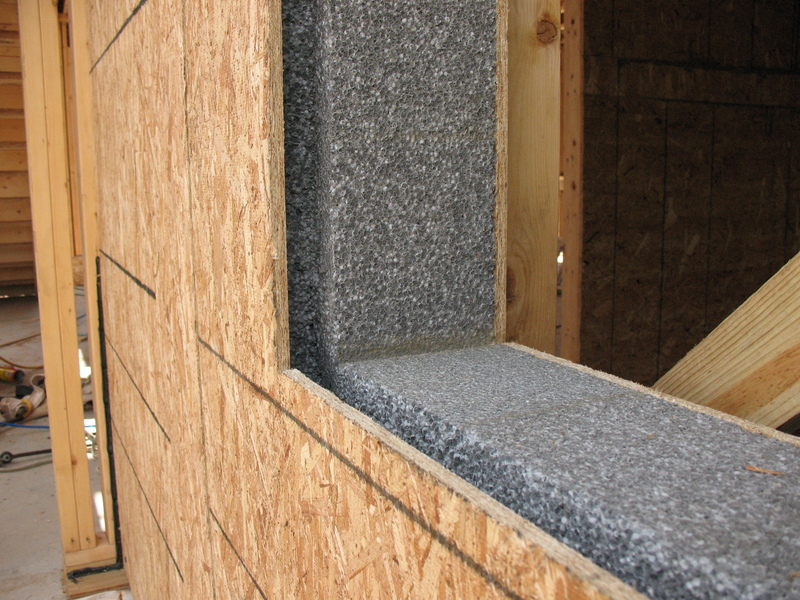 In traditional construction, the framing forms thermal bridges because the R value of the lumber is much less than the R value of the insulation placed in the cavities between the studs. Second, traditional framing is difficult to air seal. The SIPs for the TerraHaus were custom cut in the factory according to computer-aided design (CAD) drawings from the architect. The window and door openings are cut in the factory, and the four-foot wide panels come to the site in their full two-storey length. Each panel is lifted into place with a crane, and the joints between panels are carefully caulked and taped. The TerraHaus SIPs walls have an R value of 36, with a total wall R value of 50. Given the airtight envelope of the Passive House design, proper ventilation is critical for maintaining a healthy balance of air in the home. Heat recovery ventilation (HRV) is a mechanical system that exhausts air and recycles the energy of that process with the fresh air that is brought into the house. This facilitates a countercurrent heat exchange between airflows (outbound and inbound), and helps maintain a comfortable indoor climate. Ventilation systems will generally exhaust air from rooms that give off odor and moisture (i.e. bathrooms and kitchens) and react to increased moisture levels with a higher rate of ventilation. On its way out of the building, the exhaust air is pulled through the ventilator and moves through a heat exchanger. The heat exchanger then re-circulates heat energy with the incoming air. Heat is the only component of outgoing air that is transferred during this process—the incoming and exhaust air are not mixed. By means of this process, a steady supply of fresh air is available to the house. An efficient HRV system will typically provide 75-95 % heat recovery. Selecting the right windows is important for any building, but is particularly important for a home where much of the space heating comes from the sun. Windows let radiant energy into a building but lose energy through conduction and radiation. Most windows made in the United States are designed to keep buildings cool in the summer by blocking heat gain. In fact, most windows block 60% of the potential heat energy from the sun. The TerraHaus features south-facing windows that let in 60% of the sunlight (Solar Heat Gain Coefficient = 0.60). All around the house, the windows are designed to hold heat in the building. It is worthwhile to note that the commonly referenced Energy Star rating index for windows was designed for homes in the southern U.S., making it difficult to apply to homes in colder climates. To select the right windows for your own home, look for a high R value (or low U-value) to prevent conductive heat loss. For south-facing windows in homes designed for solar gain, high SHGC windows are ideal. Pay attention to not only the glazing, but the frame. Air sealing is very commonly neglected during installation– the best replacement windows on the market will be useless for energy conservation if the installer fails to air seal and insulate the space around the window frame. The landscape for the TerraHaus, and the entire SonnenHaus Village, was designed with the help of Ann Kearsley, a landscape architect known for ability to bring nature and culture together in her designs. The following landscape description is used with permission from Ann Kearsley Design. Woonerven are usually thought of as a response to the traffic and density issues in an urban environment. However, the extreme flexibility of these spaces, designed for multi-modal use and providing opportunities for improvisational programming, made them a perfect model for the shared spaces linking the three buildings in the SonnenHaus Village. 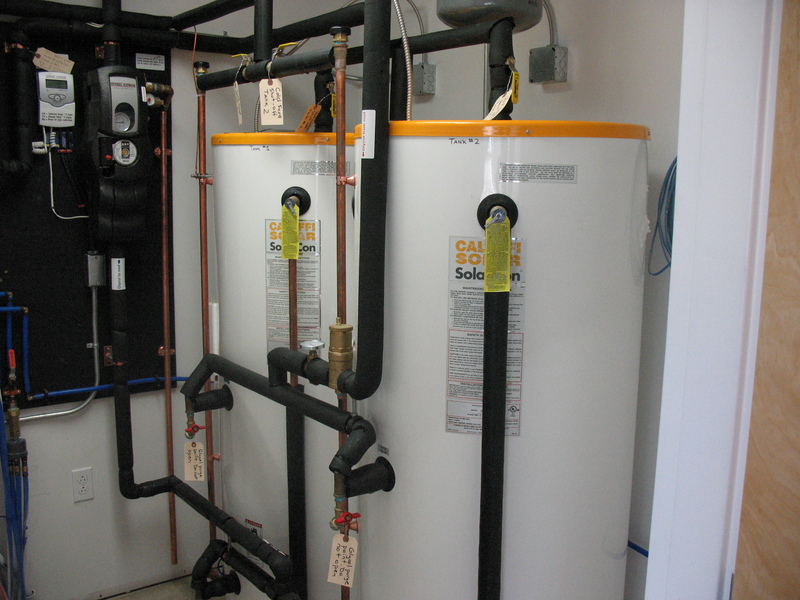 The domestic hot water needs of TerraHaus residents—showering, washing—will largely be met through a solar hot water system designed and installed by ReVision Energy, a local leader in solar energy employing several Unity College alums. The TerraHaus will use a closed loop system consisting of three 30-tube collector arrays that circulate food-grade propylene glycol from the collectors to a coil in a water storage tank and back up to the collectors. As the glycol passes through the coil located in the bottom half of the tank, the heat is transferred to the water. An electric resistance coil in the top of the tank serves as a back-up that kicks in automatically if the water in the tank drops below 110 degrees F.
The passive house standard of energy efficiency is somewhat reflected in the interior layout of the home. This is not to say that the furniture arrangement will benefit solar gain—but that the home’s interior reflects the overall focus on careful use of space. In the TerraHaus residence hall, this is evident in the way that the designers took the occupancy load into account. To comfortably house ten students in a 2,000 square foot building, every choice of furnishings and layout had to be thorough and deliberate. To realistically reflect the needs of students in a residence hall, the designers of the TerraHaus dorm sought out suggestions and expectations from a wide range of Unity College students. 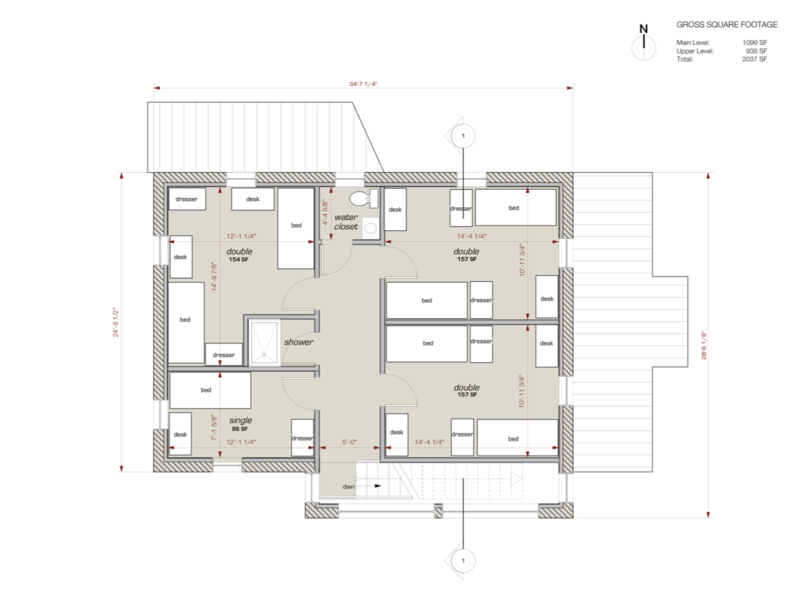 Taking ADA requirements into account, the design team came up with a layout that could comfortably accommodate the expected number of students. The placement of a house can have a significant effect on the solar energy that is available for heating the structure. 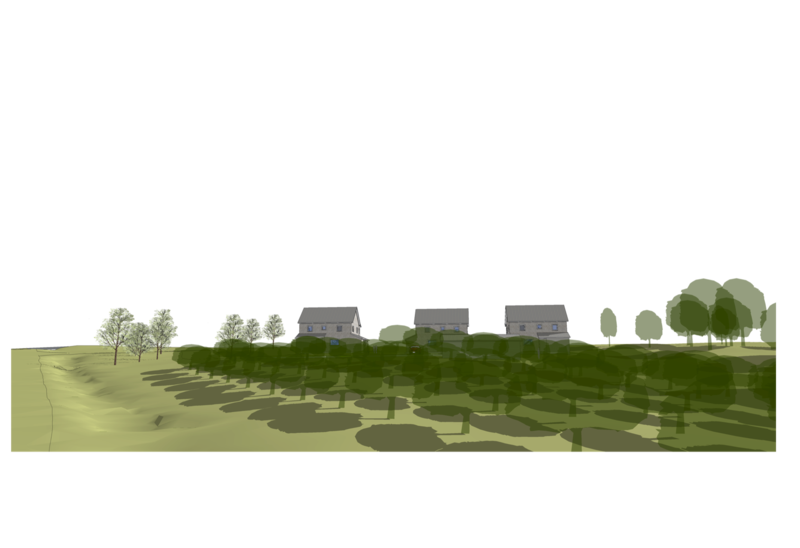 A designer can take the angle of sun by season and the features of a building site into account during their planning, and choose windows and roof angles that correspond to those requirements. For example, in the northern hemisphere, south-facing windows have a greater degree of solar gain potential. Furthermore, the sun rises and sets at different angles during the summer and winter, and a well-planned roof overhang can allow light to infiltrate during the colder months while blocking its most intense rays during the summer. Deliberate choices in landscape features, such as screening plants that lose their leaves in winter, can also augment the solar heat potential of the building. You state “(on average, human beings give off about 2.5 kW per hour in body heat! )” I thought people were closer to 100 watt heaters..does your number include other than body heat? Good catch Lee. I should have pulled a more authoritative source off my shelf. The ASHRAE Fundamentals guide agrees with you, and I corrected it above. By the way, ASHRAE lists 185 watts for light work and 470 watts for heavy work. Neat concept. 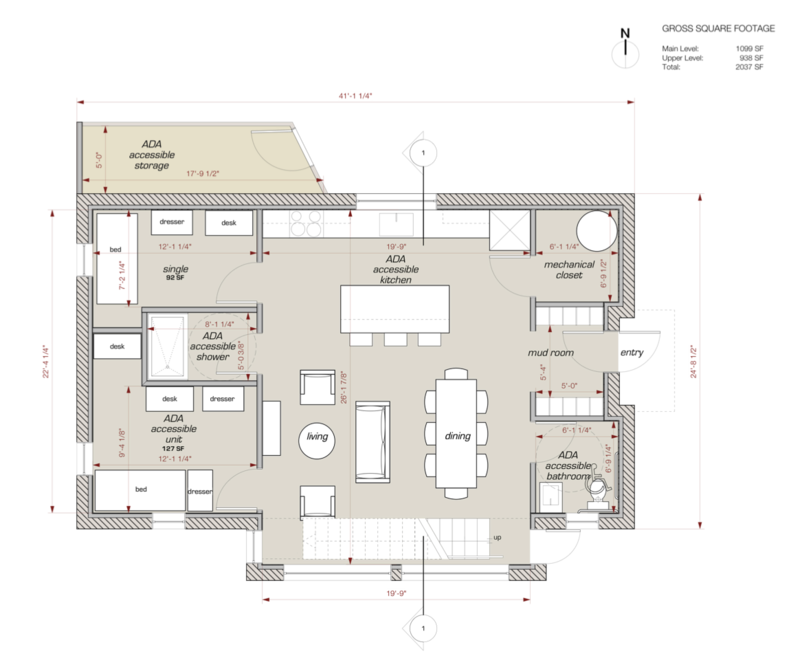 How much was total cost (from design work to final building but do not include lot cost)? Residential construction of this type is around $170 per square foot in our area. Add another $40-$50 per square foot for meeting college residence standards (sprinkler system with buried water tank, ADA costs, etc.) We needed to hit the target on this one to be the first in the nation. “Passive House inspired” construction, where you didn’t absolutely need to hit the 90% energy cost reduction target, would certainly shave some $. Breaking News: TerraHaus Passes Passive House Blower Door Test! Unity College Passive House · The Unity College TerraHaus residence hall project, where green building and green learning intersect.